Our product range includes a wide range of glucometer. 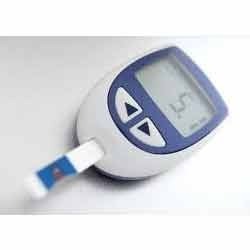 We offer a wide range of Glucometer ,which is an instrument to measure the amount of glucose present in the blood. Our range is fabricated with superior grade basic material, which are sourced from reliable vendors. Common constituents of a glocometer are strips and lancets. To test the diabetes patient for amount of glucose present in his body, small blood samples are extracted from the body using lantern and placed on a test strip of glucometer, which display the sugar level in mg/dl or mmol/l.